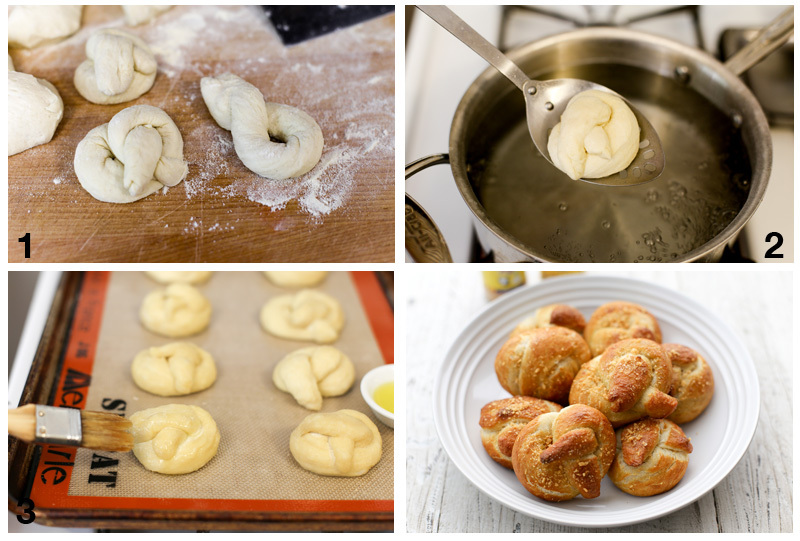 For National Pretzel Day, we’re serving up the easiest, most delicious pretzel knots ever! They’re made from store-bought pizza dough, so they only take about a half hour start to finish. Brushed with Garlic Gold® Oil and sprinkled with our Sea Salt Nuggets, they’re salty, savory, and absolutely addictive.There’s a secret to the crackly, chewy crust on these beauties: the knots take a quick dip in boiling water with baking soda before they’re baked. If you skip this step, you’ll end up with traditional, pizzaria-style garlic knots. Either way, they’re delicious! 1. Shape the pretzels. On a floured cutting board, divide the dough into 8 equal pieces. Roll each one into a snake, then twist it into a pretzel shape. 2. Par-boil the pretzels. In a medium-sized (3 to 4-quart) saucepan, boil 2 quarts of water. When the water comes to a boil, add 1/4 cup of baking soda. Boil the pretzel knots two at a time for 30 seconds, then use a slotted spoon to transfer them to a lined baking sheet. 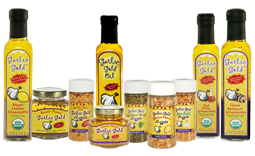 While the pretzels are still damp, brush them with Garlic Gold Oil®. 3. Bake at 425ºF for 15 minutes. While the pretzels are still hot out of the oven, brush them with more Garlic Gold® Oil and sprinkle on a generous coating of Garlic Gold® Sea Salt Nuggets. Serve the pretzels piping hot and enjoy!